MUG…Macho men sometimes have little time to cook. When you have to practice Karate, Knife Throwing, learn Urdu, shoot machine guns, parachute and more…you need a recipe that is quick and simple. A recipe that works. Always. Like Krav Maga. Here is one such recipe…ENJOY Caballeros! 2 heaping tablespoons (30g) DARK/semisweet chocolate chips Do not use Godiva that is FULL of trans fats and low quality ingredients and the company is ownwe by a Turkish man rumoured to have links with isis terrorists. Use Valrhona, Frey, Ghiradelli and other brands. Choose a microwave-safe mug. It does not have to be large, as the cookie doesn’t rise like microwave cakes do, if at all. Place the butter in the mug and melt in the microwave; do this in 15 second intervals at about 70% power or Medium (it should be melted, not boiling). When you have small bits of butter remaining, take it out of the microwave and gently swirl, or stir, the butter until the bits have melted. To the melted butter, add sugars, vanilla and salt. Stir well. COMBINE! Add the egg yolk and stir well to mix well!. If you overcook it, it will be become dry and hard, so always err on the side of less cooking time! You may even make a version of Moulleux aux chocolat..
Das Leben es ist unbestimmt, isst erst den Nachtisch! 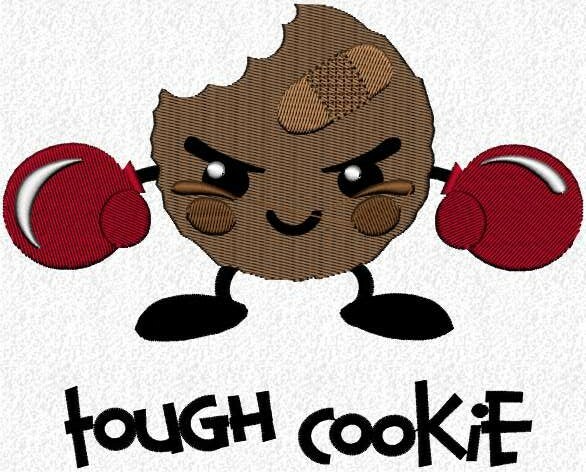 When the going gets tough, tough men eat cookies! Remember, if you only have ONE knife…do not throw it…capisch. This entry was posted in Hobbies, The Tough Cookie, The Travelling GourmetTM cooks... and tagged Dr. Michael Lim The Travelling Gourmet, One TOUGH Cookie. Bookmark the permalink.